PHOTO: The Lakewood First Aid today received an old Fire Chief’s vehicle as a donation to their volunteer squad. 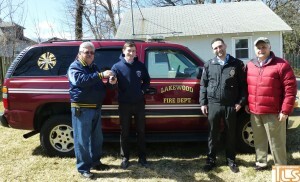 There are 6 Comments to "PHOTO: Board of Fire Commissioners Donates Old Chief’s Vehicle to LFA"
Wow that’s very nice. Kudos to all our volunteers! Why wasn’t it donated to the Volunteer firefighters to use to carpool to fire school and classes? Many other volunteer departments use old chief trucks for their volunteers to go back and forth to classes at the fire academy and save on gas. For all your talk about supporting your volunteers this is something basic that has been brought up before and clearly fell on deaf ears again. Hey Mr Firefighter when did you request it? To who did you request it? Pleas give us more details as the commisioners don’t remember being asked for it? why was not hatzolah asked it they could use such a vehicle? everyone stop being so negative why this one and that one didnt get it! 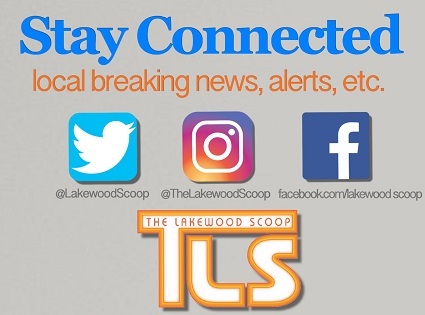 Doesn’t Lakewood EMS have a first responder already. What the people need is an ambulance coming to them not another first responder vehicle.